M-System’s PC Recorder Series provides a low cost industrial grade data acquisition system using free combinations of remote I/O hardware and monitoring/recording software. Field I/Os connect directly to the remote I/O modules and data is transmitted via Modbus RTU protocol over an RS-485 network. Ethernet network, Modbus TCP/IP protocol, is also usable either directly by Ethernet I/O modules or via a protocol converter by Modbus RTU I/O modules. 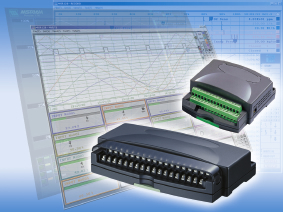 Complete M-System’s remote I/O lines including R1, R3, R5, R6, R7 Series, are available for PC Recorder applications. They can handle not only temperature, millivolt/voltage/current or discrete signals, but also other field sensors such as strain gauge and pulse generating pickups. Furthermore, a wide variety of power measuring modules for AC voltage/current, watt/var and energy inputs are ideal to monitor and analyze energy consumption trends in detail by production line to build up a new energy saving scheme. The R1M, R2M and RZMS/RZUS modules are shipped with the free MSRPAC software package which includes the MSR128 and the PC Recorder Light. These economical modules are ideal for small scale temperature scanning applications such for silos, furnaces, ovens in many industrial fields, greenhouses, hydroponics plants, machine test benches and weather monitors. By using the universal input module RZMS/RZUS, other types of sensors signals, e.g. vibration, can be monitored together for failure analysis applications. Ideal for basic logging and trending purposes. Maximum sampling rate of 50 ms for 8 channels, 500 ms to 1 minute for the total of 120 channels. Ideal for logging, trending and analyzing continuous process and batch applications. Up to 128 channels can be monitored simultaneously. Maximum sampling rate of 500 ms for 128 channels. High speed sampling 100 ms with R3 series TCP/IP module. Active trend view to compare in real time past and present data overlapped on each other. Arithmetic and logic functions, including the ones performed between channels. Alarm history and data search functions.